Maybe you’re a student in your last year of your degree and you need help and guidance transitioning into working life? Maybe you’re a young professional looking to level up in your career? Maybe you need additional support and encouragement to improve your work performance? Maybe you’re a young entrepreneur looking to start your own business or venture? Our 2018 Spring/Summer program will facilitate the network and connection between mentors and mentees, allowing mentees to address their individual challenges with a more experienced professional in their field of interest. No matter what stage of your career, our aim is to support your personal and professional growth, to gain new skills and break through your barriers. Our supportive program and network will allow you to reach out to senior professionals and collectively strategise how your career goals can be achieved. The program starts with a buffet dinner on 19th March 2018 and ends with a buffet dinner on 16th July 2018. This program is available for everyone! please email Madeleine at Maddy@jingjobs.com. Discounts and Vouchers from our venue sponsors. A lucky draw will be conducted at the closing dinner, only eligible if you have connected at least 4 times with your mentor in the given time period. 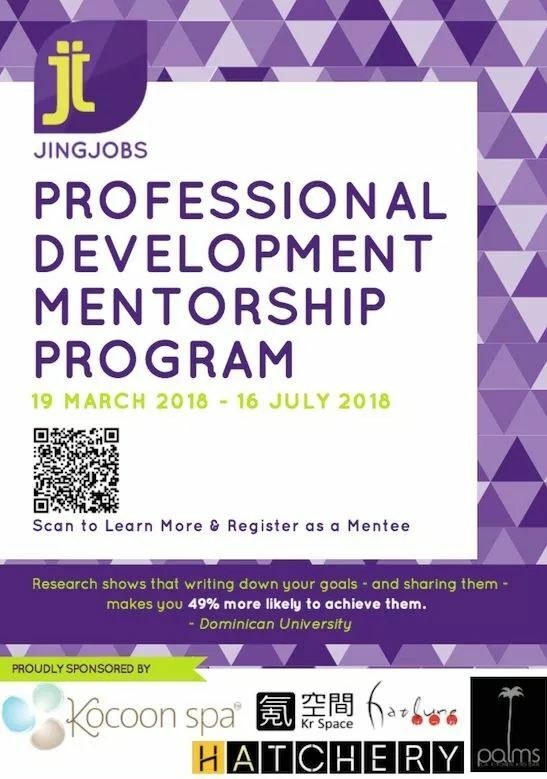 Support from our JingJobs staff regarding any issues during the program to ensure progress is being made and that mentees will hit their own personal and professional goals! Networking sessions with other professionals on the program. 1 x free entry to a future 2018 JingJobs event of your choosing.